While it’s good to have all your favorite music stored in your iPhone’s storage, it can lead to storage issues if your music collection is huge. 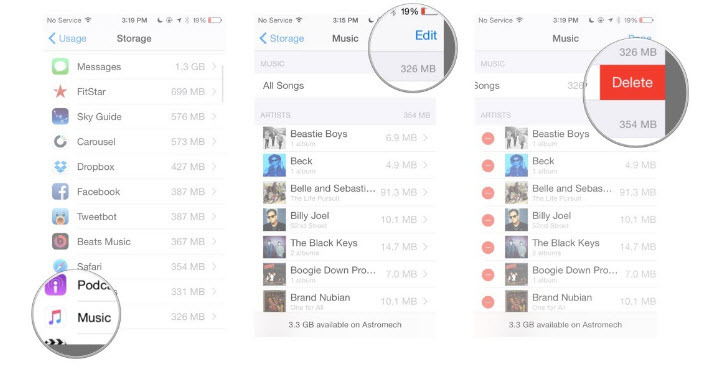 This storage issue could be frequent in older iPhones that have low storage space. Fortunately, there are 5 ways about how to erase the music from iPhone so that you can free up needed space. Step 2: Navigate to General > Storage & iCloud Usage. 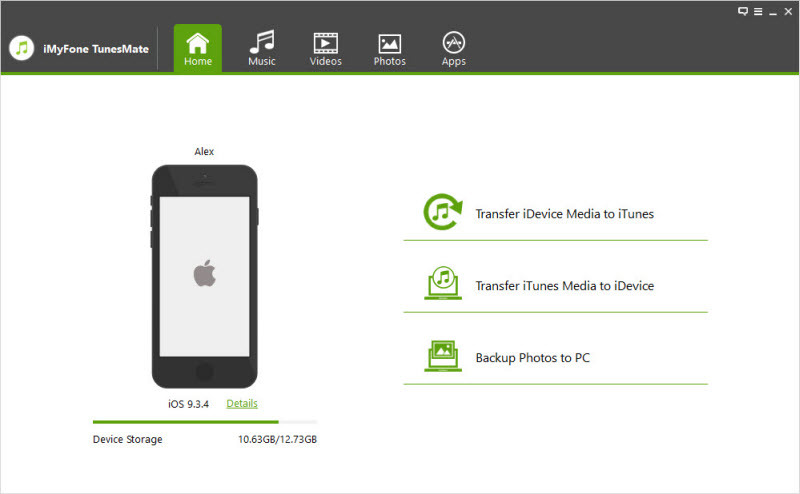 Step 3: Locate Manage Storage option. It will be under Storage section. Step 4: Now tap on Music and then select what you wish to delete. To delete a single song, you will have to tap on Artist’s name and then their Albums page. There you will find the list of songs. Step 5: Once you find the song you wish to delete, tap Edit and select Delete. 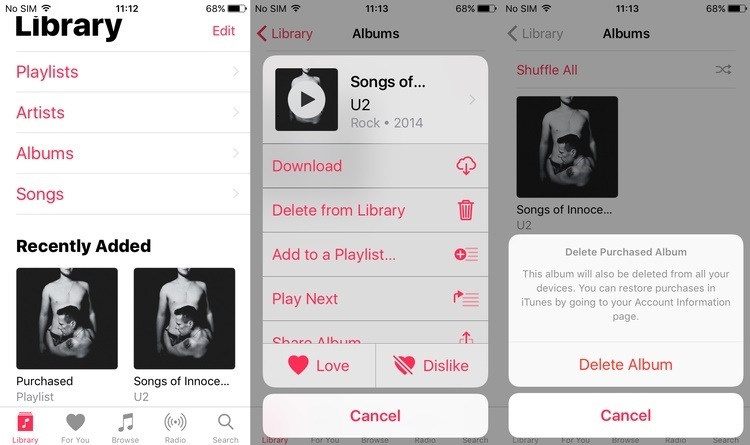 The selected song will be erased from your Music app and your iPhone immediately. Step 1: Launch Settings app on your iPhone and navigate to General > Storage & iCloud Usage. Step 2: Find and select Manage Storage. A list of apps will show up after you select it. Step 3: Now tap Music and then instead of selecting All Songs, select the Album you wish to erase. Step 4: After selecting the specific Album, tap Edit and choose Delete. Step 1: Launch your iPhone’s Settings app and navigate to General > Storage & iCloud Usage. Step 2: Find and select Manage Storage option and then select Music app from the provided list. Step 3: Now tap Edit option available at the top right corner, select All Songs and then tap the Delete button. Step 1: Launch iTunes and connect your iDevice to your computer. Step 2: From iTunes, select the iPhone icon located at the top left and then click Music option available under Settings. Step 3: As default, the Sync Music option as well as other options including selected playlists, albums, artists, genres, etc. will be ticked. Step 4: You just have to make sure that no songs or other items are ticked. It should say ‘0 songs’ next to Sync Music option. Step 5: Now click the Apply button. That’s it! All your iPhone music will now be deleted. Another way to delete your iPhone music easily is by using a good third-party iPhone music manager. iMyFone TunesMate is one of the best iPhone music managers that lets you effectively manage all your music on your computer. You can either erase the music selectively or all at once via TunesMate. Erase all your iPhone music quickly with just one click. 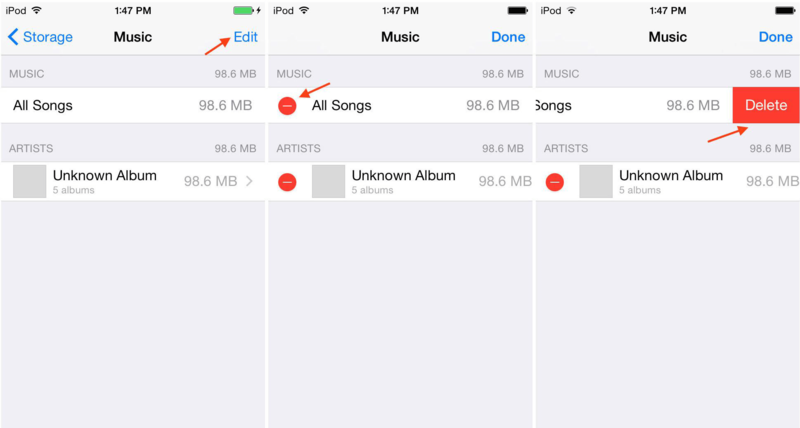 Preview your iPhone music before selecting and erasing it. 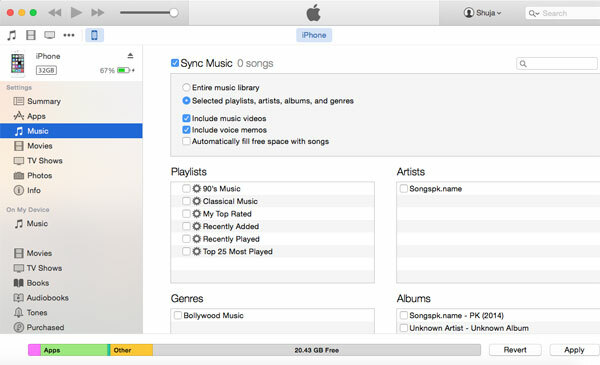 Using TunesMate to erase your iPhone music is a lot faster than using iTunes to do it. You can transfer purchased and non-purchased music between your iPhone and computer/iTunes freely. Edit music meta data such as album art, title, song number, year, etc. Apart from managing music, TunesMate also allows you to manage other media files such as photos, videos, apps, podcasts, etc. Step 2: Plug in your iPhone to your computer. TunesMate will recognize it upon launch. Step 3: Click Music from the list of tabs on the top of TunesMate interface. A new window will open, listing all the available music on your iPhone. Step 4: Use the checkboxes alongside the songs to select the ones you wish to delete. After selection, click Delete option located at the top. Step 5: Click Yes when prompted. Your selected songs will now be erased.